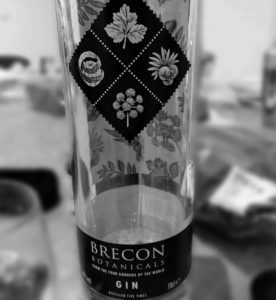 I like gin and I like Wales, so Brecon Botanicals seemed like a great choice when I saw it on the shelf. This may seem like a weird thing to say, but Welsh water is lovely. Here in the English midlands we do get water from Wales through the taps, but it’s traveled far and spent time in English limestone. In Wales is softer – and, this is where it gets strange – colder, straight from the tap. Brecon Botanicals is made with Brecon water, so that’s a great base to start with. They haven’t gone stark staring mad and tried to make it only from botanicals grown in Wales – lava bread gin anyone? It has a fairly standard mix of botanicals, and they advertise that they come from all four coners of the globe. The point of a globe is that it’s round really and doesn’t have any corners at all, but let’s not quibble. The gin leads very much with juniper. There’s lots of bright fresh lemony citrus following through afterwards. It steadies through into a warmer, spicier finish. Adding tonic kicks the lemon flavour up a gear. It’s very drinkable, and priced to drink at less than £20 a bottle in Waitrose. It’s made at the same distillery that makes Welsh Whiskey, Penderyn. I haven’t yet tried this, but will do, next time I’m in country. I’ve tried Welsh wine, and whilst it’s unlikely to fly off the shelves just yet, it’s pretty good too.